In a medium bowl, cut the butter into the baking mix until it resembles coarse crumbs. Add milk and 3 eggs; stir until dough forms. Drop dough onto the prepared pan in 1/4 cup increments. Flatten slightly, bake for 10 minutes. Allow to cool slightly. Cut 4 biscuits in half and spread one side of each with 1 teaspoon of strawberry preserves. For the omelet: Coat a small pan with cooking spray. Sauté half the spinach until wilted. In a small bowl, beat 1 egg. Add to the pan, season with salt and pepper. Cook over low heat until the top looks cooked. Sprinkle 2 tablespoons of cheese over one half of the egg. Flip the other half over to cover cheese, forming an omelet. Remove from heat and allow to rest for 1 minute. Cut in half, place on bottom half of two biscuits. Replace the top half; repeat process to make 2 more sandwiches. 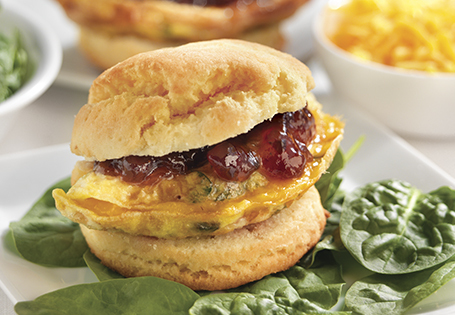 TIP: Since this recipe makes more than enough biscuits, freeze the extra biscuits and defrost them as needed!